I’ve been working on series of strategy options for engaging young people in local democracy activities through Facebook. The two key platforms for engagement that support some level of dialogue appear to be Facebook pages, and Facebook groups. So I though I’d try and get a sense of when you would choose one over the other. If you were looking to host a discussion between young people and local councillors on Facebook – which would you use? You can create a Facebook group for just about anything. They can be used as serious discussion forums, virtual petitions where membership indicates support for a cause, a space for sharing photos and videos or a way of subscribing to get messages from an organisation (amongst other things). As the creator of a group you gain control over which features of the group are enabled, and whether it is visible to all members of Facebook, or is closed and visible only to invited Facebook members. Facebook groups are never visible to non Facebook users. Users of Facebook can ‘join’ your group and then post messages on the ‘wall’ or in the ‘discussion forum’ (which allows for threaded discussions). As the group owner you can send a message to all your group members – this will appear in their Facebook inbox. You can also invite group members to events created through the Facebook event system (which allows RSVP guest lists etc.). You generally have to visit a group regularly and to use the messaging feature to keep discussions flowing. You can create a ‘Facebook Page’ for any entity such as a club, youth council, youth project etc. Unlike groups which have ‘members’, and which are only visible to logged in Facebook users, most of a ‘Facebook Page’ can be visible on the wider internet to those without a Facebook account, and have ‘fans’. You can send updates to fans, but these will only be displayed on the side of a users homepage when they log-in, rather than appearing in their inbox. This means they are likely to get less attention that messages sent to group members. You can add some ‘applications’ to pages, similar to the way you can add applications to your Facebook profile. For example, you could add an RSS application to your page that would pull in the headlines from your blog, or from another discussion board, to display on your Facebook page. Here is an example page created for Practical Participation. Facebook presents you with visitor statistics to let you know how many visitors you pages are getting. ‘Updates’ sent to those who decide to be a ‘fan’ of your page are lower key than messages to group ‘members’. Facebook users are less familiar with pages than they are with groups. Visitors still need to be a member of Facebook if they want to join in discussions on your page message board. When would you choose one over the other? Groups if I wanted to quickly host a discussion with those already on facebook, but without building a presence on Facebook right now. What would your choice be? Surely the first question is whether to host it on Facebook or not. The privacy issues around Facebook and the amount of information that gets broadcast to your friends could (or perhaps should) inhibit discussion. The broadcast feature of Facebook is both an asset and as you identify a potential privacy issue. There have been many groups on Facebook that I thought might be fun to join but when I think about what my various friends might think I sometimes resist. I maybe be different to most people but I suspect not. A quick question, is their anyway at all you can feed the Group discussions out of Facebook to a facebook page or even better a blog? I have just setup this Group and would like to export out of facebook… If this is not possible I’m actually thinking about Google Forums instead. As far as I’m aware the group forum’s don’t provide a feed which you can take out to elsewhere. Discussions in groups appear to take place in a ‘walled garden’, and discussions on pages, whilst in the open, can only be added to by members. Thanks for the info. I’m going to use the Facebook Group to simply update members of news and events. Another major difference is the way they let you categorize groups vs. pages. There are 2 completely different hierarchies. It seems that there is some forward thinking going on, especially around ‘local’ pages for restaurants, bars and the like. Can you even search for local pages yet? just wanted to say hello and thank you for the post. Very helpful. I currently work as an Online Community Manager at a national media arts organization in the United States. 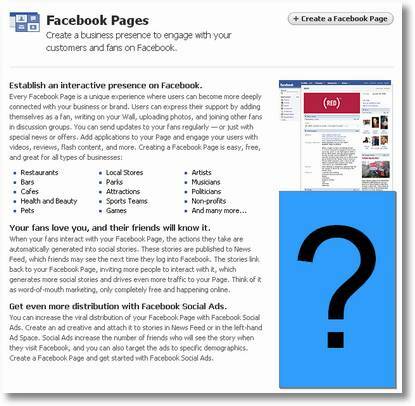 We are currently thinking about starting up our own Facebook presence and I found this post helpful. Looking at the same issue, so far my experience of Pages has been very disappointing, whereas our Groups have been very successful. No, non-FB members can see them too. There’s another big difference – the sharing tool available. As far as I can see, groups have a proper, large “tick the friends you want to tell about the group” tool that appears after you join a group. Fan pages, in contrast, have just a share button, which pops up a message dialog where you have to think of and type the names of your friends in. I suspect groups spread much better than fan pages for this reason. If we knew then what we know now (or if we had read this post before creating our Psoriasis Cure Now page), we DEFINITELY would have created a group instead. Pages are largely invisible in practice and the ability to email group members into their inbox alone is reason enough not to go the page route. Sigh. Pages do allow you to add html, though, so that actually has a benefit. Pingback: To friend or to fan on Facebook? Pingback: links for 2009-03-14 « Where is my towel? Pingback: links for 2009-04-06 | Ip's. I’m struggling to get our facebook group (for a charity) to serve our needs. For example we want to post photo albums of different groups’ team-building events, but I can’t seem to display an album anywhere within the group. Any suggestions? Debbie, you can’t post albums on groups. It is just an amalgamate of different photos from different group members. If you want to set up albums, consider setting up a page instead. Hi Tim, just found your site while looking for information on whether to start a group or a page. I thought you might be interested in our project, which was inspired by Don Taspcott’s book “Grown Up Digital.” It’s a website called http://www.theyoungandthewireless.com, intended to tell the stories of how young people’s lives have been affected by technology and social media. It’s just a blog right now, but the content will all be up at the end of this month. I hope you check it out, and become a fan of our page on Facebook. I read above that you can’t have albums in a Group, but I think that if you’re the admin for the Group, the ability to sort photos (If only the ones posted by you) would make much more sense than a hodge podge of hundreds of pics. When I weighed the pros & cons,for my purposes, a Group fits all my needs except in this regard. Is there any possibility for a mod any time soon? It seems that Facebook Groups are just a remnant of the “old” Facebook (pre-Newsfeed). Pages have essentially become the current hub for organizing the way that Groups used to do. I wonder if at some point Facebook won’t merge the two features. Facebook pages are better than facebook groups because it’s easy to invite people on fan page and also easy to manage and update it on regularly basis. I was just wondering if I joined a group, can the admin of that group or it’s other members see my profile, pictures, and other such things?My privacy settings only allow friends to see them, but I wasn’t sure if joining a group puts the admin and it’s members under the “friend category”. Started working at a start up marketing/promotions company in Barcelona, this is a a new adventure for me as my background is in finance. Does anyone know of any applications for downloading lists of people/groups members from either pages or group pages from facebook? Really useful post, will you be updating it when the new changes to Facebook pages happen soon? I’m not planning on updating this post at present. If any suggestions for an alternative that I should direct people to then do let me know.. I have create a facebook page and I wonder how I can send a photo via page update? I saw that i can write only a text and i can’t send a photo or a link. Is there a way?? Thank you very much it was great and help full, i found this article easily in Google when i wrote what is the difference between face-book group and face-book pages, thank you very much again. Hi Tim. I happened upon this post through a Google search. Great stuff. I’m used to using Yahoo Groups for discussion amongst neighbors, but I’m trying to decide if FB would be a good alternative, since most people are familiar with it. My problem is that I can’t figure out how to replicate the Yahoo feature of having an email address that users can post discussions to which copies all members of the group for all replies. It seems that with a FB group, you have to be more proactive as a member in going to the group page to see discussions. You don’t automatically get included on all discussions via email unless you post a reply yourself. Based on your research, do you have any insight or recommendations? For discussion I think Yahoo Groups is still a very good bet – particularly if you point out to people they can access digest mode if they don’t like too many e-mails. The poor integration of Facebook groups with e-mail makes them pretty poor as discussion spaces in most cases. You could though use a Facebook page as a ‘shop front’ for the Yahoo Group – pulling in headlines from the Yahoo Group using the RSS feature, so that anyone who is a fan of the page gets the opportunity to see what’s going on through the Yahoo group – and is enticed to join. Pingback: Should You Create a Facebook Page or Facebook Group? Hi there! Thanks for the post. I found it useful, all your comments, as well. Does anybody now how to change the account the org page is linked to. I created a page for my organisation and didn’t necessarily want to link it to my personal account, so I created a new account. No it’s obviously not working well, because I have no friends on my new account and people are wondering what am I doing with two accounts anyway! Please if anyone can help that would be great!! Thanks for sharing a good blog. You can bring a goog point that Both ‘Facebook pages’ and ‘Facebook groups’ offer a way of promoting activities and of hosting a discussion between different Facebook users. Both can have a discussion wall, and discussion forum. This difference is needed one for myself in facebook applications. Thanks for postings. Hi Tim. I’m wondering if there’s a way to link a page to a group, and vice versa. I work for a school and the school has it’s own page but there’s also an alumni group. As a marketing tool, I want them to be linked. Any ideas? Thanks Tim. Yeah I was hoping the page could be added as a member of the group. But at least maybe the Alumni group could “like” the school’s page, which I’m guessing the administrator could do. Pingback: Facebook Fan Pages vs Facebook Groups: What’s The Difference?